For predictable screening and scaling-up of a chromatography purification step, reliable and reproducible column packing is very critical. We have extensive experience in handling a broad range of chromatography media, from soft to rigid, from small particles to large particles, from light particles to dense particles and from polymer-based particles to inorganic-based particles. The resin can be of any type you choose. 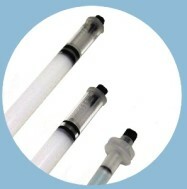 We can pack high performance and robust disposable chromatography columns from small to large (e.g. 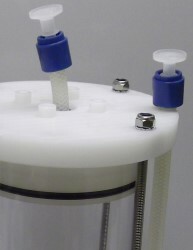 1μl to 10 litres), for cGMP or non-cGMP applications, using our proprietary column design. The bed height can be anywhere between 0 cm and 60 cm. Features standard connections, which are compatible with most common chromatography instruments such as AKTA etc. For each packed column we will test HETP, Peak Asymmetry and Flow Properties (if required). For cGMP grade columns, in addition to the above tests, we will also test Endotoxin and Bioburden levels. We can pack a column according to your protocol or develop the best predictable packing process for you. According to your special applications, we can also tailor our column design to suit your needs. The available column sizes and their characteristics can be seen in the tables below. Please contact us to discuss your requirements in details. 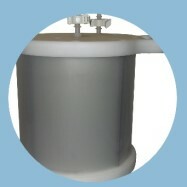 All products are compatible with most commonly used aqueous buffers. For special chemical or certain organic solvent compatibility please contact us. 50 mm 19.6 ml All wetted materials are of USP class VI grade and/or FDA CFR 177 grade. Standard: 3 bar Yes For cGMP grade applications, each column will be packed inside a clean room and sanitised. Besides the above tests, the endotoxin and bioburden levels will be tested. Chemical compatibility: All products are compatible with most commonly used aqueous buffers. For special chemical or certain organic solvent compatibility please contact us. *We could make customised columns of these diameters for cGMP use, please contact us for more information.